The Eastern Class of 1959 recently held its 59th class reunion. Pictured are (first row) Janice Hayman Young, Janice Caldwell Weber, Norman Hysell, (second row) Sharon Summerfield Donahue, Janet Vineyard Giland, Donna Frecker Ihle, Ina Mays Van Meter, (third row) Homer Cole, Carl Baker, Gilbert Spencer, Nat Carpenter and Bill Pooler. 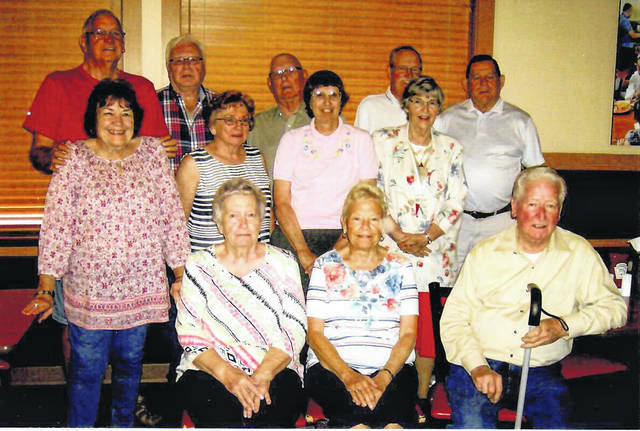 Members of the Eastern High School Class of 1959 met recently at the Golden Corral in Parkersburg, West Virginia, for their 59th class reunion. Cards were signed by the members for Paul Boring and Hubert Wolfe, who have some health issues. Gilbert Spencer had prayer before the meal. Those attending wee Carl Baker of North Canton, Ohio; Janet Vineyard Giland of Lucas, Ohio; Nat and Marlene Carpenter of Rutland, Ohio; Norman and Patty Hysell of Middleport, Ohio; Gilbert and Mary Lou Spencer of Pomeroy, Ohio; Sharon Summerfield Donahue of Coolville, Ohio; Homer and Mary Cole, Ray and Janice Hayman Young and Ina Mays Van Meter of Reedsville, Ohio; Donna Frecker Ihle, Bill and Debbie Pooler, and Steve and Janice Caldwell Weber of Racine, Ohio. There was a brief meeting and it was decided to have the 60th reunion at Sharon Donahue’s Party Barn. Guests attending were Raven, Jordan and Desaray Hart of Pennsbora, W.Va., and John and Kila Frank of Reedsville, Ohio. https://www.mydailysentinel.com/wp-content/uploads/sites/14/2018/09/web1_EHS-Reunion-Pic_ne20189517534890.jpgThe Eastern Class of 1959 recently held its 59th class reunion. Pictured are (first row) Janice Hayman Young, Janice Caldwell Weber, Norman Hysell, (second row) Sharon Summerfield Donahue, Janet Vineyard Giland, Donna Frecker Ihle, Ina Mays Van Meter, (third row) Homer Cole, Carl Baker, Gilbert Spencer, Nat Carpenter and Bill Pooler.